This animal pest alert provides information on the identification, biology, and pest potential of the house crow in Australia. 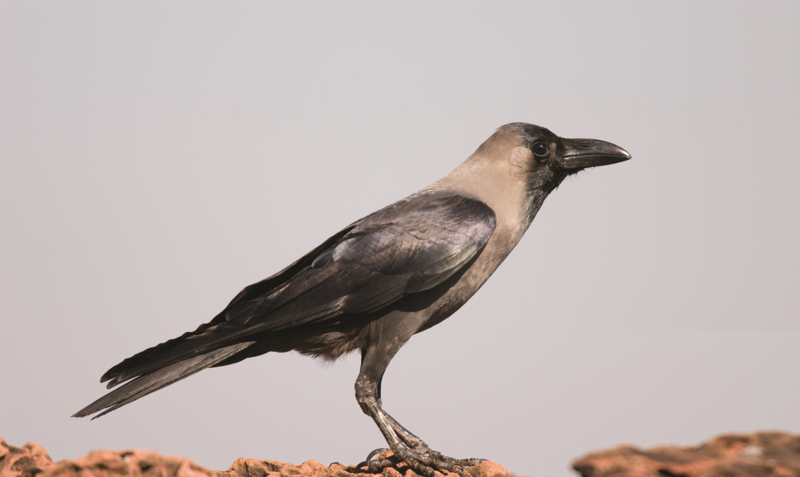 The house crow (Corvus splendens) is also known as the Indian, grey-necked, Ceylon or Colombo crow. It is not native to Australia but has been transported here on numerous occasions on ships. The house crow has significant potential to establish populations in Australia and become a pest, so it is important to report any found in the wild. The house crow is 42-44cm in length (body and tail). It has black plumage that appears glossy with a metallic greenish blue-purple sheen on the forehead, crown, throat, back, wings and tail. In contrast, the nape, neck and lower breast are paler in colour (grey tones) and not glossed. The bill is black and the upper beak is strongly curved. The forehead is sloped and the eyes are dark brown. Legs and feet are black. Male and female birds look similar, although males are slightly larger. Immature birds have little or no sheen to their plumage. The house crow is smaller and more slender than all native corvids (about 10cm smaller than the Australian raven). Its voice is a short, repeated caw-caw-caw which is very diﬀerent from the drawn-out aah-aah-aah-aaaaahhhh of the Australian raven or the nark-nark-nark of the little crow and the calls of other native corvids. The house crow also lacks the long ﬂoppy throat feathers (called hackles) of the Australian raven.